More than a call to action, Gandhi�s quote, �Be the change you wish to see in the world,� is a reminder to tend our own gardens. Many spiritual teachers have said that when the finger of blame is pointed at someone else, there are three other fingers pointing back at us. This poster is an inspiring way to call on ourselves to make a difference first in our own lives, in our own relationships, in our own ways of being. Who we are being will ripple out to have an effect on our friends, family, workplace, city where we live, country and the world. We can go from there to change the world, having first cleaned up our own act. Remembering this point of view takes the macro down to the micro so we can see it more clearly. Then take action accordingly. 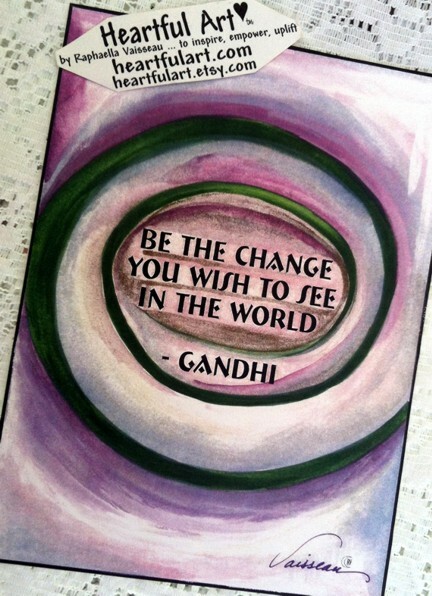 Raphaella painted this poster with a lavender and green spiral intentionally to call forth the peace of lavender and the healing color of green as one of her universal symbols for earth and sea in harmony. From space, eddy fields, caused by the movement of the oceans� currents, look like spirals in the sea. This is a motivational present to inspire us all to make a difference in the world by making a difference first in our own lives. It's a great gift for yourself as well as for any one you know who is (or wants to be) changing the world for the better.